Do you want to grow your website traffic, generate more leads & increase conversions? With our comprehensive online programme, you will learn how and why Content Marketing really works. This six part programme guides you through each step, to the top. 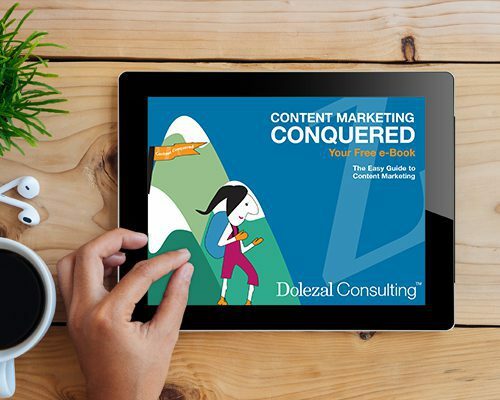 Content Marketing Conquered includes materials and techniques that have been thoroughly road-tested by hundreds of successful content marketers. From the first session, learn how to conquer content marketing, build your business profile online and boost your profits. It’s time to conquer your fear of the blank page, video screen or microphone. On our six-part course, you will learn how to increase your website traffic, attract more leads and most importantly, conversions. You will also learn how to establish your voice as a trusted authority in your niche and grow your business – all through content marketing. The course is fully online so you can work through each module when you want, where you want and at your own speed. Each programme includes materials and techniques that have been thoroughly road-tested by hundreds of successful content marketers. 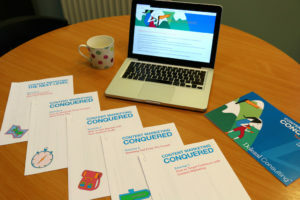 There are six videos and five workbooks to help you build on your progress through the programme. There is also a private Facebook group where you can chat with others and find fresh ideas and content every week. With our comprehensive online programme, you will learn how to make Content Marketing work for you. Where will this online programme take you? If you are a business owner, you will save thousands on outsourced solutions. Whilst your business is growing, you may need to squeeze marketing in to a busy schedule or out of a tiny budget. This course will help you build your marketing layer by layer. You will improve the copy and content on your website, social media profiles and online directories. You will also learn how to ‘batch’ time for content creation and how to be super-efficient. If you are a marketer, you’ll develop valuable skills that can help you flourish in your current role or make you a standout candidate for your next role. If you need to make a modest marketing budget stretch further, content marketing is a godsend. You can create (write, record and design) content free of charge and self-publish on your website and social media accounts, or email to your mailing list. It’s also a killer combo with SEO and PR. If you want to develop your career in content marketing, this course will take you through the fundamentals of content marketing so you gain a level of insight clients will value. You will then build the skills you need to become a proficient and professional content marketer. This will increase your appeal to clients and agencies, along with maximising your fees. Whatever your goal, you will learn how to establish your voice as a trusted authority in your niche and grow your business – all through content marketing. “All aspects of the course content were invaluable to me at this stage of my journey. I loved the attention to my company values and key statement, also my client profile (invaluable to my upcoming website revamp). I LOVED the ‘creating great content’ part as well”. I’m new to marketing – will I be able to keep up with the other the programme? This programme is designed for anyone who wants to promote their business online using Content Marketing. Whether you’re in a marketing role or want more customers for your own business, we will guide you through the steps you need to take in order to get started. We will also share the strategies of successful content marketers who keep going, creating and sharing great content regularly, building trust and confidence in their marketplace. We’ve included all the materials from two full days of training, plus a content audit that may take up to one day to complete. This is a training package we sell for £1,800 – £2,350 depending on the size of the client’s organisation. You get all this for fraction of the cost. Plus, you don’t even have to leave your office! We run regular, live content marketing workshops here in Northern England but now we want to help people – anywhere in the world – see what content marketing can do for them. You can view the training videos on a laptop, tablet or mobile phone device. We will send links for you to download each workbook, which you can then print and complete in your own time. We have found that it’s better to work with pen and paper as it frees your creativity, rather than having to type neatly into little boxes. After all, you are not filling in an application form, you’re creating a brand new strategy for your business.